- Kelly Burke, Electrical Contractors Association of Ontario. The Electrical Contractors Association of Ontario (ECAO) and International Brotherhood of Electrical Workers (IBEW) are not only on the cutting edge of the smart building revolution, they’re the only group licensed in Ontario to provide training in this technology. Imagine a large facility that’s open 24 hours a day, like a manufacturing plant, a data centre, a hospital, or an airport. Now imagine that sensors are set up everywhere to help do things like automatically dim the lights if no one is in the area, or even scale back heating and cooling. This can add up to big savings in the long run. Power over ethernet (PoE) is the electronic foundation of “smart” buildings. It’s a technology that allows a single cable to supply both digital network connectivity and power. It’s now being used globally to find efficiencies, help workers collaborate, save on operating costs, and provide usage data to enable better decision making. ECAO-IBEW’s partnership in providing world class network cabling specialists has won them prestigious contracts for banks like RBC and the Bank of Canada, government data centres, mass transit systems, and high tech companies across Ontario. 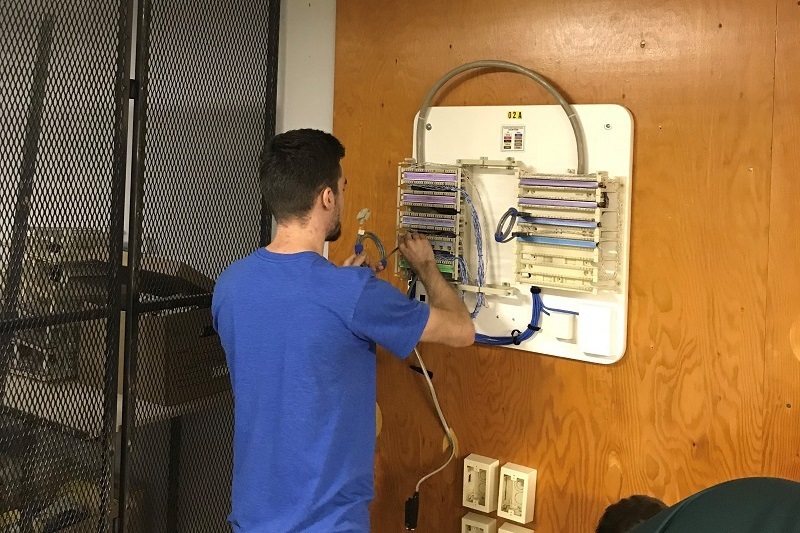 In order to ensure maximum safety and reliability for a PoE system, it’s best to hire a network cabling specialist (NCS) certified electrician, otherwise known as a communication electrician. Becoming a certified electrician requires a 5-year rigorous training program. Adding the NCS designation means an additional training challenge. NCS trainees go through a 4,000-hour apprenticeship and take two, 10-week sets of courses. At the end of the program, they understand all aspects of PoE systems, and can wire up any business or home. There are lots of advantages of having workers with both licenses wire a facility,” says Swick. 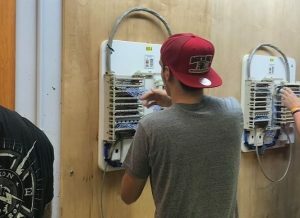 IBEW 586 Assistant Education Director George Kardaras agrees, and adds, “These days, there’s a lot more power travelling through network cabling, up to 90 watts. Bundled together they can generate a lot of heat,” he says. Back in 2010, OEITTF’s Provincial Training Director, Peter Olders starting hearing more and more about the “Internet of Things” (IoT). “I started telling all of the Locals that they’d need to get on board or they’d lose out,” he comments. Chris Swick is one of the Locals that understood the message loud and clear. He and Olders have been working for over five years to develop their NCS program, and have it approved by the Ministry of Education and Advanced Skills Development (MAESD). Competition for places in the NCS program is fierce. “The people we see signing up for the program are the keeners who really want to make sure they know everything about the technology,” says Swick. As with any IBEW training program, it’s not just about the ability to think logically. Ensuring only the best candidates are accepted is important for an industry that doesn’t stand still. “Advancements in technology means the work being performed today will not be performed in the same manner tomorrow. You are constantly learning and upgrading your skills in order to stay ahead of the curve,” says Swick. Because we’ll be depending on these systems for economic prosperity and even personal safety, it’s essential these systems are wired correctly. Certified workers who know what they’re doing and why will play a key role in building our connected future.